The Garden of Hope Foundation in cooperation with other Taiwanese partner organizations held a press conference in Taipei today to announce the dates and the venue of the 4th World Conference of Women’s Shelters (4WCWS) and launch the new website for the conference. 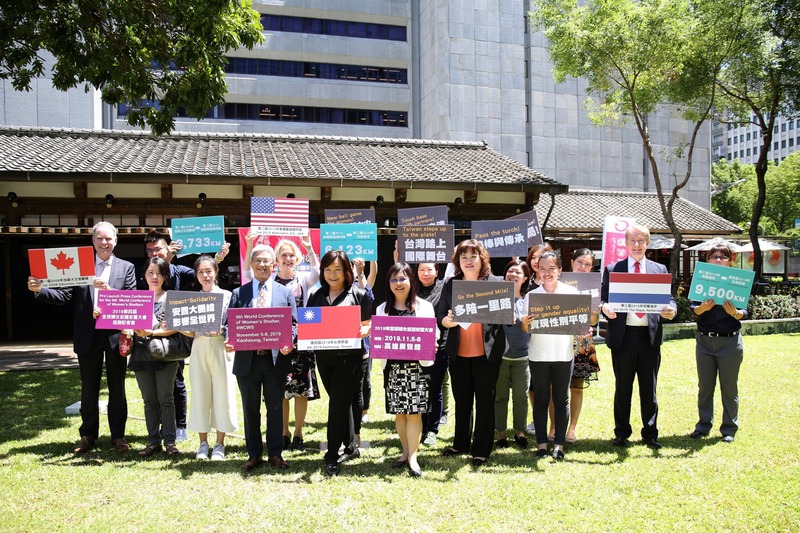 Held at the beautiful Rose Historic Site in central Taipei, the press conference was attended by representatives from the Taiwanese government as well as the Canadian, US and Dutch trade offices to hand the torch from the host nations of the previous three World Conferences to Taiwan. The 1st World Conference was held in Edmonton, Alberta in 2008, the 2nd took place in Washington DC in 2012, the 3rd World Conference was held in the Netherlands in 2015, and 4WCWS will be held in Kaohsiung, Taiwan, on November 5-8, 2019. Because all four hosts are baseballing nations, the press conference had a baseball theme, with representatives of the four countries walking around a mini baseball diamond in a symbol of bringing the 4th World Conference of Women’s Shelters to Taiwan on the home plate. Michael McCulloch, General Affairs Director of the Canadian Trade Office led the batting, followed by American Institute in Taiwan Consular Section Chief Lara Harris in second, Netherlands Trade and Investment Office Representative Guy Wittich at third bat, and representing Taiwan at fourth bat the Garden of Hope CEO and Chairperson of the Global Network of Women’s Shelters Chi Hui-Jung, Political Deputy Minister of Health and Welfare Lu Pau-Ching, and Deputy Minister of Foreign Affairs Hsu Szu-chien. 4WCWS is jointly hosted by the Garden of Hope, the Global Network of Women’s Shelter, the Asian Network of Women’s Shelters, and other Taiwanese NGOs. The event will bring together 1,500 to 2,000 leaders and practitioners from 120 countries, who are working on the frontline of ending gender-based violence.